The KEN (Ketogenic Enteral Nutrition) diet is a radical diet that couldn't be simpler - eat nothing for ten days. All of your nutritional needs are supplied by your own body fat - and the special liquid formula that is dripped into your stomach through a thin tube. As for the inconvenience of lugging the pump everywhere, and the social stigma of having a plastic tube hanging out of your nose, Dr Shidrawi shrugs. ‘The pump is very light and extremely quiet,’ he says. 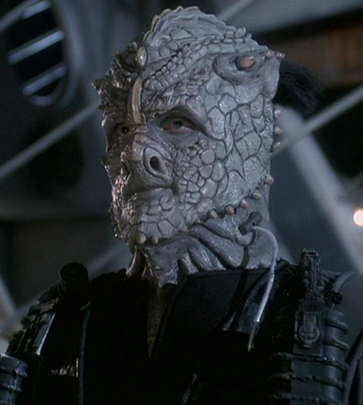 Fans of Star Trek: Deep Space Nine might be thinking about the Jem'Hadar, who take their nourishment in a similar manner. The only nourishment they require comes in the form of the hormonal enzyme Ketracel White or simply the white. Without this drug, Jem’Hadar go into severe withdrawal, resulting in loss of cognitive and motor functions. They will lose their shrouding ability and regress into a highly aggressive stage, not discriminating in whom or what they attack, including their Vorta superiors and peers. Lack of white will eventually kill a Jem’Hadar. The Founders use the Vorta to supply the Jem’Hadar with the white. It is administered through cylinders that fit into a system near a Jem’Hadar's collar, which is then fed directly into the Jem’Hadar via a tube running into the carotid artery. Fans of sf Grandmaster Jack Vance might be thinking of the Meks from his 1967 Hugo award-winning novel The Last Castle. The Mek, standing as if a specimen in a museum case, was a manlike creature, native, in his original version, to a planet of Etamin. Via the Daily Mail. Thanks to Moira for finding this story and reference, and sharing it with us.